Wren’s Nest is a wilderness program for preschool-age children. Students at Wren’s Nest learn by interacting with the natural world. Willowell is proud to partner with Treleven Farm in New Haven to host Wren’s Nest Mondays through Fridays, from 8:00-2:30 with an extended programming option from 2:30-4:30. Wren’s Nest Preschool admits students and families of all socioeconomic status, race, ethnicity, religion, gender, sexual orientation, nationality, and disability. "Our daughter literally bawls her eyes out when there's a snow day. She loves school, and therefore, I love it. Staff are fantastic, setting is majestic, she's learning, it's everything I could ask for." "As a result of Wren’s Nest our child is very much at home when she is outdoors, in the woods." The Wren’s Nest teachers are outdoor educators whose teaching styles are flexible and creative, allowing them to adjust plans in the moment to suit the evolving needs of the students. Their curriculum depends less on rigid structure and more on independent exploration—allowing each child to engage with their natural environment through play and with the guidance of trained instructors. Wren’s Nest is a holistic, interdisciplinary, and sensory-based approach to learning, and a companion program to Willowell’s nationally-recognized outdoor high school program, The Walden Project. Wren’s Nest’s goal is to foster students’ independence and an initial understanding of their interconnectedness with the whole world. Kids come away with a deep level of comfort and love for the land they play and learn on. Above all, Wren’s Nest creates a space for children to cultivate their natural sense of awe and wonder. The program incorporates specific themes rooted in the changing bounty of the land and the seasons. Areas of study include wild edibles, fire building, tracking, shelter building, sensory awareness, bird language, singing, movements and yoga, garden planting and harvesting, wetland walks, drawing, journal writing, clay work, nature sculpture, natural dyeing, indoor and outdoor cooking, scavenger hunts, storytelling, special guests, dancing, singing, and an age-appropriate end of year rite of passage. Wren's Nest runs with the Addison Northeast Supervisory Union calendar. Wren's Nest Forest Preschool- a classroom in nature. I. Download & complete application form (or request a hard copy mailed to you). II. Submit $50 (non refundable) application fee. III. Mail both to The Willowell Foundation, P.O. Box 314, Bristol VT 05443. IV. You will hear from us ASAP once we receive your application. Children who will be aged 3 or 4 by September 1, 2019 and who are enrolled for at least 2 full days per week are eligible to receive state preschool funding towards 10 hours/week of preschool tuition. Additional tuition costs are the responsibility of the family/guardian. Wren’s Nest plans on being a Pre Kindergarten partner. We will have licensed teachers, our curriculum will align with the Vermont Early Education Standards (VELS), and we will record documentation for children using Teaching Strategies Gold. These three components were established by the Vermont Agency of Education (AOE) for participating partners. Children who are 3 or 4 prior to 9/1/2019 and are enrolled for at least 2 days per week will receive state preschool funding for 10 hours per week toward preschool tuition. For information about state subsidy for income-eligible families click here: Child Care Financial Assistance. Hello! I am Suzanne Young and I use she/her/hers pronouns. I am overjoyed to begin the journey as Wren’s Nest Forest Preschool director and teacher exploring the web of relationships between children and the natural world and creating opportunities for deepening all of our knowledge and wonder of the cycles of nature through the seasons. I was born and grew up in Vermont and spent my childhood gathering maple sap in spring, picking raspberries in summer, feeling the crunch of leaves under my feet in fall, and entering the magical spruce forest to build snow shelters in winter. I am convinced this early time of my life along with the adults who nurtured this connection began my deep love and respect for nature. Wren’s Nest is an opportunity for me to create a similar love of nature in children and their families. I hold a BS in Elementary Education and Environmental Studies from the University of Vermont and am pursuing a Master’s in Leadership for Sustainability from the University of Vermont’s School of Natural Resources. For the past eight years I was the chef and farm to school educator at Mary Johnson Children's Center in Middlebury, Vermont where I blended my love of the outdoors and seasonal and local food into nourishing meals for young children and teachers. In other lives I lived and taught as an environmental educator in Maine and had an organic farm in Orwell, VT. I now live in Bomoseen, VT. I am passionate about engaging and immersing young children and all people in the natural world, exploring new food choices, practicing cooking, finding joy in digging in the dirt, and tasting garden grown foods. I seek to live in balance with my work and my close family life with two teenage boys and my active senior parents; spending time together in the woods, waters, gardens, and going on adventures to new places. Lindsay’s everlasting curiosity and love for the earth took root during the summers she spent as a child in the Adirondack Mountains. The vast land of lakes and forests were her summer teachers and the freedom found there guided her to live and teach in Vermont. She has a BS in Environmental Studies from UVM, which led her to the Lake Champlain Waldorf Kindergarten, working as an intern with long time educator JoAnne Dennee. JoAnne’s curriculum in particular emphasized time spent outdoors and guiding children to recognize their part in caring for and honoring the land. This is what attracted Lindsay to JoAnne’s class, and after graduation she began working as an assistant to JoAnne and lead teacher in the After Care program. In the three and half years spent at LCWS she was able to learn from a mentor and develop her own style of teaching that weaves together natural art, farm and food education, the freedom to explore and imagine, and most importantly sharing in joy. She is currently finishing her Masters in Early Childhood Education through the VT Higher Education Collaborative. 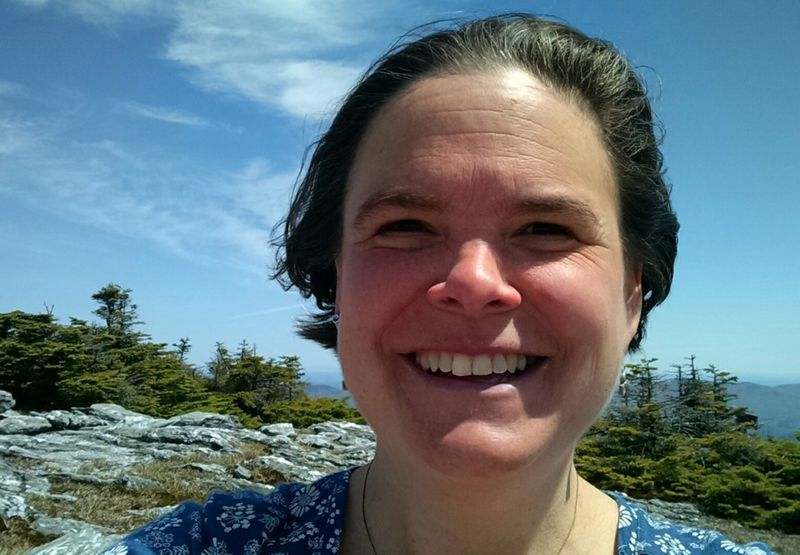 Lindsay’s passions include gardening, foraging, nutritional and herbal healing, birding, hunting for wildflowers, hiking, backcountry skiing, and playing in the Green Mountains. She is so excited to share in many of these with the children at the Wren’s Nest this year. Hello! I am Rini Lovshin-Smith and I am thrilled and honored to be the newest member of the Wren’s Nest community. Having grown up in Vermont I have close connection with nature and I feel being in the natural world is a fundamental part of life, especially in early childhood. My richest childhood memories are of making mud pies in the back yard, creating fairy homes in the woods, and digging tunnels through snow banks. I love how the natural world continuously offers authentic and joyful explorations to people of all ages. I have a BS and teaching license in early childhood education as well as a Masters degree in special education. I have spent the past 7 years working at the UVM Campus Childrens School mentoring pre-services teachers and implementing a social constructivist lens for creating curriculum. A social constructivist approach aligns closely with the emerging curriculum here at Wren’s Nest. Before working at UVM I worked with Suzanne at Mary Johnson, and I am so excited to be working along side her again! As a new mom, I strive to be outdoors with my family as much as possible in hopes that our son will embrace nature as my husband and I have. We love to hike, take family walks, as well as swim in the lake and cross country ski. Vermont is such a unique and beautiful place and we try to appreciate it every day. Katherine Taggart is our AmeriCorps State member serving at Wren’s Nest for the 2018-2019 school year. She will be serving directly with the children four days a week. She graduated from the University of Vermont in May 2018 with a BS in Food Systems. Katherine has been working with and mentoring youth since a young age, and is excited to get involved with the teaching world. Her goal is to educate through nature and food. She wants to help educate others on where our food comes from, how to feed our bodies well, and how to prepare food on our own. Katherine grew up in Massachusetts and was raised by parents who encouraged being yourself, playing outside, and being kind to all. She has grown into a person who is passionate about the outdoors and equality for all beings. She hopes to incorporate these values into her own teaching. She spends her free time doing yoga, trail running, hiking, swimming, skiing, baking, and especially exploring new places and ideas. She hopes to create a garden and to encourage open-minded thinking, a love for the outdoors, and a new appreciation for plant based foods with the Wren's Nest students.